A new digital LED concept is set to revolutionise automotive interior lighting, reports Sally Ward-Foxton. As automotive manufacturers continue to add intelligent driver assistance features to passenger cars, and the prospect of fully autonomous cars comes closer to reality, there are a variety of opportunities to use LED lighting to complement these features. For example, ADAS (automotive driver assistance systems) which use radar and cameras to survey the road around the car, could be complemented by an interior lighting system which illuminates either side of the cabin to warn of obstacles. This ‘light splash’ could be green for an upcoming exit, or red for a vehicle in the driver’s blind spot. As vehicles move from intelligent driver assistance systems to fully autonomous driving, the demands for interior lighting will change dramatically (see above). Today’s vehicles keep the driver and passengers in the dark, which is especially important at night when the driver needs to maintain night vision. Once the car is completely able to drive itself, passengers may sit face-to-face and talk, which may require ambient lighting bright enough to see each other or even read. The trouble is, today’s LED lighting technology doesn’t allow complex applications like these to be achieved in a cost effective way. As Inova Semiconductor’s Sales and Marketing Director Thomas Rothhaupt explained, a typical solution for automotive ambient lighting using today’s technology uses one to five LEDs each driven by a driver IC, with groups of RGB LEDs driven by a microcontroller via a 4-5 wire SPI bus (Figure 1 - page 24). If individual control of LEDs is required, each RGB LED needs its own microcontroller. The flexible plastic light strips used in car interior lighting which incorporate 10-30 RGB LEDs can render only a uniform light colour over their length since changing any parameter (such as the colour) on a single LED, means all the LEDs would have to be addressed and updated. The control circuits that would allow this dynamic control are prohibitively expensive for most automotive applications. It’s also not feasible to capture data on LED ageing. Inova Semiconductor has come up with a solution for automotive interior LED lighting which addresses the cost of the control electronics required. 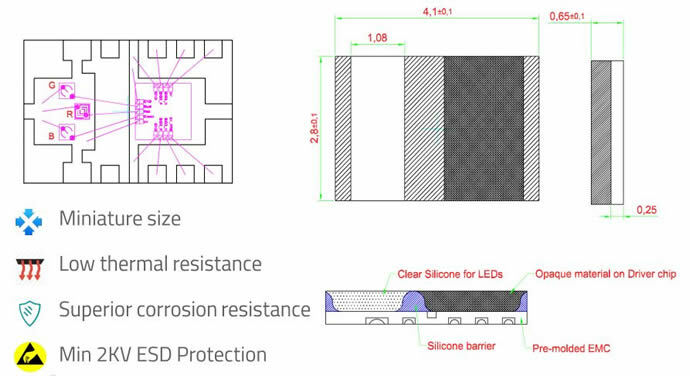 The new concept, called ISELED (integrated smart ecosystem for LEDs), enables more dynamic lighting features at lower cost, simplifying the control system by integrating an LED, a small LED driver chip and an advanced communication link into one 3x4mm package (Figure 2). This will completely remove the need for the time consuming and expensive binning process, Rothhaupt said, along with transferring the calibration parameters to the microcontroller, since calibration is done at the end of LED manufacture and the data is stored on the controller chip inside each individual LED. Calibration happens automatically at the LED (no more lookup tables held separately) and even temperature compensation is handled automatically on the same chip. The temperature, status and functionality can be accessed for each LED. ISELED allows lighting colour accuracy to be maintained over the full range of LED ageing and over a wide temperature range, since LEDs exposed to direct sunlight on the dashboard need to display the same colour as those in the direct path of the air conditioning. This is now possible without any further calibration by tier 1 OEMs. ISELED’s bidirectional serial interface allows fast, dynamic lighting effects to be achieved easily using any of 16 million colour choices. Does adding high tech silicon to every LED module really save cost versus the external microcontroller plus driver approach? While Inova’s new digital controller die can drive RGB LEDs in constant current mode, with 24-bit resolution (three 8-bit), and control brightness of each with 12-bit resolution, full realisation of the concept relies on not only the drivers, but also LED hardware plus LED module and system integration expertise. Above: Figure 3. The ISELED RGB LED module concept developed by Dominant Opto Technologies incorporating Inova’s driver die. The extremely low thermal resistance of the housing, which is 30% lower than in comparable products, reduces the power consumption of the LED by delivering better light efficiency with cooler LEDs. Inova has brought on board partners to cover all of these bases as part of the ISELED Alliance. The theoretical framework for the idea was developed by Pforzheim University. The red, green and blue LEDs are manufactured by established automotive tier 2 supplier Dominant Opto Technologies, who also handle the integration of the Inova controller and the LEDs into tiny modules (Figure 3); Dominant calibrates each of these modules during final test and stores the calibration data on the module’s internal controller. NXP provides the system microcontroller, the S32K144, an ARM Cortex M with ASIL support, which is scalable enough to deal with systems with just a handful of LEDs all the way up to the full 4,096 LEDs. System integrator TE Connectivity is integrating the modules into the flexible plastic light strips that are used in the vehicles. The first samples of the ISELED LED modules will be available from Dominant Opto Technologies in Q1 2017, with a demo kit from Inova due shortly afterwards. As for the future, Rothhaupt speculates that the automotive market may only be a starting point for ISELED. What's both a car and a room?